Craftin' Caro: 15% off stamps today only - Monday Oct 29! 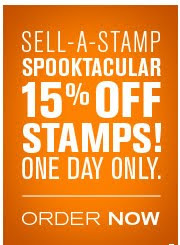 15% off stamps today only - Monday Oct 29! Starting today at 12:00 AM (MT) and ending at 11:50 PM (MT), almost every stamp we sell will be 15 percent off! This means all stamps in our current catalogues including: Background stamps, Personalized name stamps, Cookie press stamps and Single-image stamps! This DOES NOT include: Hostess sets, Bundled stamp sets or Digital stamp brush sets. Also, take advantage of the new single clear-mount stamps being offered. These won’t be sent to you in our typical cases or packaging; they’ll be packaged in cello bags. If you’d like a case for your stamp, you can buy our Clear-Mount Stamp Cases that come in packs of four (item 119105). So go order online and take advantage of all the savings! !